The axe will fall on 764 trees to make way for Phase II of Namma Metro. While 432 trees will be chopped for extending the Phase I reaches, 332 trees will be cut for the two proposed lines. 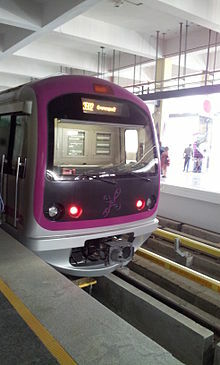 But the Bangalore Metro Rail Corporation(BMRC) has promised to plant 10 saplings for every tree that is cut for Phase II of the project. The Phase I of the project, however, had resulted in about 1,600 trees being felled and had faced stiff resistance from the city's environmentalists. The Phase I runs across a length of 42.3 km in the heart of the, while the Phase II lines are proposed to span a length of 72.09 km. The Phase II may have ruffled quite a few feathers with the government proposing special cess on properties living along the project route as well as its catchment area. But the authorities are underlining a string of positive fallouts of the project.